Do you want to get The Last Best Box or send it as a gift, but can't wait until the next month's box is shipped? 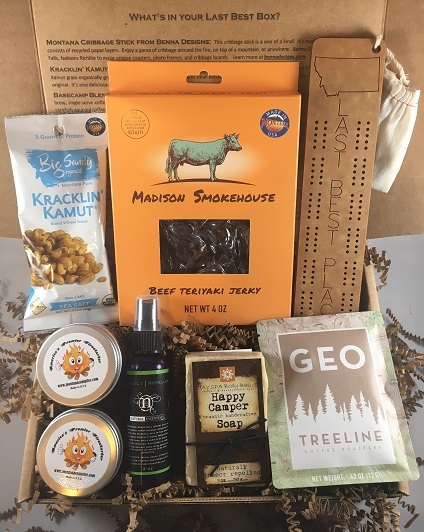 Consider one of our Montana Outdoor Adventure Boxes! It includes Montana Cribbage Stick from Benna Designs (Columbia Falls), Happy Camper Soap from DAYSPA Basics (Missoula), Basecamp Blend Geo Coffee Packet from Treeline Coffee Roasters (Bozeman), Kracklin’ Kamut® from Big Sandy Organics (Big Sandy), Lightnin’ Flame “Backpacker” Emergency Firestarter by Montana Campfire, LLC (Victor), Beef Teriyaki Jerky from Madison Smokehouse (Ennis), and Natural Insect Repellent from Natural Essentials (Churchill). **This box is separate from the subscription, and can be shipped anytime. We use USPS 1-3 priority mail, and generally ship your box 1-3 days after you place your order. Contact us if you have any special instructions! Cheers!